Mpls. Art Lending Library offers works free of charge. News flash: Living with art isn't cost-prohibitive. Yes, that headline is a fact, in part thanks to the Minneapolis Art Lending Library. Operating like a cross between a bookmobile and a mini-art gallery, MALL sets up shop at city parks four times a year. This summer's event takes place Thursday at Powderhorn Recreation Center in south Minneapolis. "Everything I check out is something that can hang on the wall so that my cat doesn't bother it," said Melanie Keating, who has been borrowing art through MALL for two years, including oil paintings, prints and photos. "Living with art has allowed me to get familiar with the artist, even though my budget doesn't allow me to purchase anything." Two recent favorites are "Bienvenido a Miami" by Ethan Sherman, a blue-red-green multi-tone enamel painting that illuminates any space, and "Interior Scene I" by Stephanie Kunze, portraying a sad-looking young woman sitting at a round table with a bunch of animal companions. The inspiration for MALL came to co-founders Mac Balentine, Julia Caston and Larsen Husby when they were studying in France. On a side trip to Berlin they visited the Neue Berliner Kunstverein, which for nearly 50 years has lent art through its Artothek. For a minor insurance fee of 3 euros (about $3.50), Berliners can choose from among more than 4,000 works from the 20th and 21st centuries. "We were captivated with the idea," Balentine said. "When we settled back into the Twin Cities, we decided to bring that to the community in Minnesota." What: Summer lending event offering more than 100 artworks to borrow for free for the next three months. When: 5-8 p.m. July 27. Where: Powderhorn Recreation Center, 3400 15th Av. S., Mpls. They launched MALL in 2013 as a grass-roots effort out of Balentine's and Husby's apartment (a space that doubled as the Ledge Gallery). Soon they received a Minnesota Regional Arts Council grant, and eventually began partnering with organizations such as Stevens Square Center for the Arts, which was the first physical location for the library. As happens with art projects, Ledge faded out as MALL took precedence. MALL lends mostly photos, paintings and drawings, but also smaller 3-D works. Its collection has grown from 30 pieces to more than 100, representing about 60 artists. It puts out quarterly calls to artists, and 15 to 30 people typically send work their way. "We want the collection to evolve over time so that returning borrowers have an opportunity to see fresh work," said Amelia Foster, the organization's outreach and volunteer coordinator. Pieces must be no more than 40 inches in any direction, and no more than 20 pounds. Between lending events, art is stored in a climate-controlled storage unit in Minneapolis. And artists can request their works back at any time. If borrowers like pieces enough to buy them, the artists receive 75 percent of the cut — a bigger share than they might get from a gallery, which typically splits the proceeds 50/50. Works tend to go for $100 to $500. MALL occasionally buys pieces that do well with borrowers. 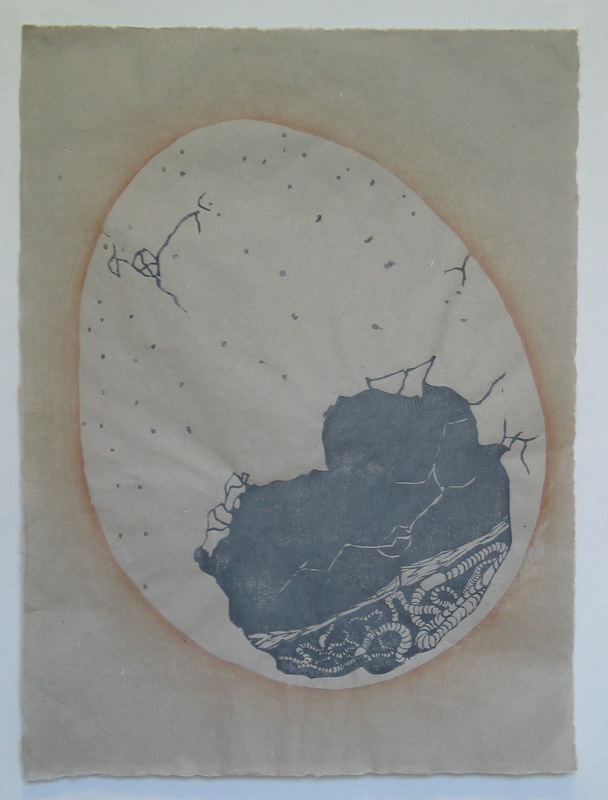 "Cracked and Inhabited," a woodblock print by Emily Hoisington depicting worms inside a cracked eggshell, has been borrowed almost every single round since 2013. MALL decided to purchase it this year as a cornerstone of its collection. The organization also hosts a fellowship program. Artists receive a $300 honorarium and compensation for supplies up to $100, which they use to lead a workshop at the lending event. On Thursday at Powderhorn, Taylor Champoux will teach people to print postcards using relief printing techniques. People can take the postcards home or leave them with Taylor, who will then randomly mail them to other participants. This summer, MALL has 15 new pieces and 102 returning. Husby is most excited about works coming from Interact, a program for artists with disabilities in St. Paul. But he says it's always a pleasure to showcase returning favorites such as Keith Holmes, whose large-scale black-and-white photos depict crowd scenes, human interactions and people in relationships. "The photos are genuine; they capture very specific moments and look serendipitous," Husby said. "There's one with two women in it called 'Reunion' — the women laughing with one another in a hallway — and it looks funny and real and intimate. I would guess that's why people like them. That's why I like them."